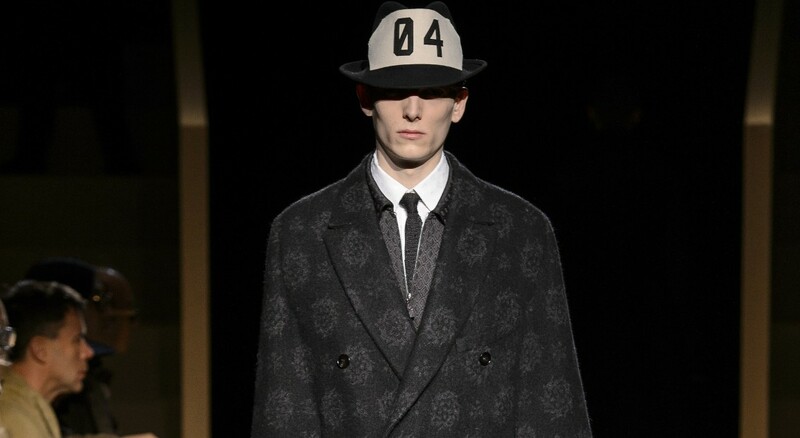 Stefano Pilati’s mastery of jacquard outlined Ermenegildo Zegna for FW16. Weaving intricacies in with immaculate tailoring, Pilati’s newest offering was a subtle yet striking step up from the bare-boned and block colour workings of his FW15 ensemble. Refined styling was magically remodelled. The palette of the night sky graced the runway, midnight blue and shadowy grey was scattered with delicate decoration as models displayed oversized overcoats illuminated with patterning resemblant of constellations – galaxies condensed and fabricated. 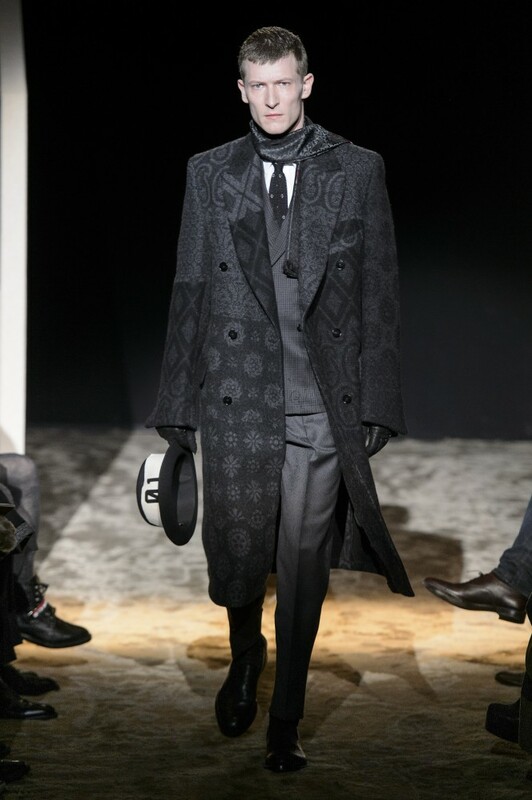 The embellishment was discreet but dazzling, spanning the collars and lapels of the coats. Formalwear came very much relaxed, with trousers fuller around the waist, draping down in folds of slate, azure and aubergine wool to the leather toe-capped derby shoes. Suit jackets were an eclectic mix, in shape, colour and fabric; monochrome silk was smothered in jacquard detailing, giving a more casual feel to the collection, and Zegna’s reputation for exquisite formalwear was upheld and adapted with loosely-tailored wool blazers cut in longer-length. Pilati’s presentation of knitwear was a highlight; cashmere V-necked sweater vests sported zigzag patterning, whilst funnel and cowl-neck knits came adorned with spiral, jewel-set, detail and diamond-shaped appliqué. With a dusting of astronomical allure, Pilati elevated the classic elegance of Ermenegildo Zegna to ethereal luxury.